It can’t be summer without a BURGER recipe, can it?! I haven’t actually posted a full-on burger recipe for a long time. Two years to be exact, when I posted these Greek Turkey Burgers with Whipped Feta and these Moroccan Chickpea Sliders. It’s time to make up for it! And boy, do I ever have a burger for you. I guess I’ve been relatively lucky lately to nail some recipes on the first try. But these burgers gave me a bit of trouble. It was all about the texture, because I got picture-perfect and super tasty veggie burgers on my first try. But when I bit into them, it was like taking a big bite of mashed potatoes. Yech. Not in my burger! So I had to play around by adding some texture in the form of sunflower seeds, rolled oats and panko breadcrumbs. And I finally got the perfect blend of texture and a pretty photogenic burger, too! 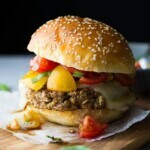 I really wanted to infuse these burgers with lots of bruschetta flavors. There’s a touch of balsamic vinegar in the patties. These flavors were just perfect together, and this isn’t wimpy vegetarian food…this is enough burger to fill up my 6 foot 3 husband! And he didn’t even have room for sweet potato fries or salad or any side dish. PS: It’s 30 Minute Thursday! 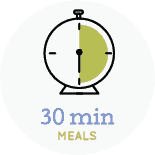 Check out all these mouthwatering meals you can make in under 30 minutes! 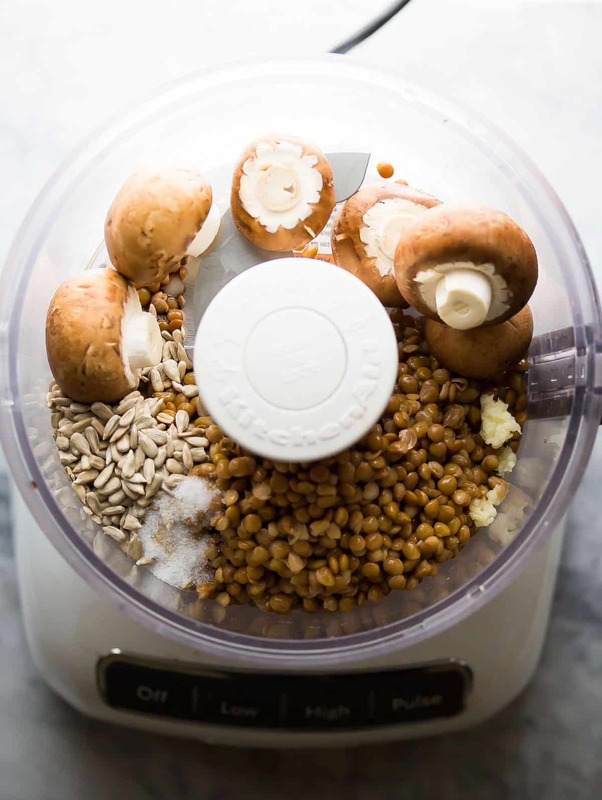 Place the mushrooms, lentils, garlic, worcestershire, salt, balsamic vinegar, and sunflower seeds in the base of a food processor, and pulse 10 times. 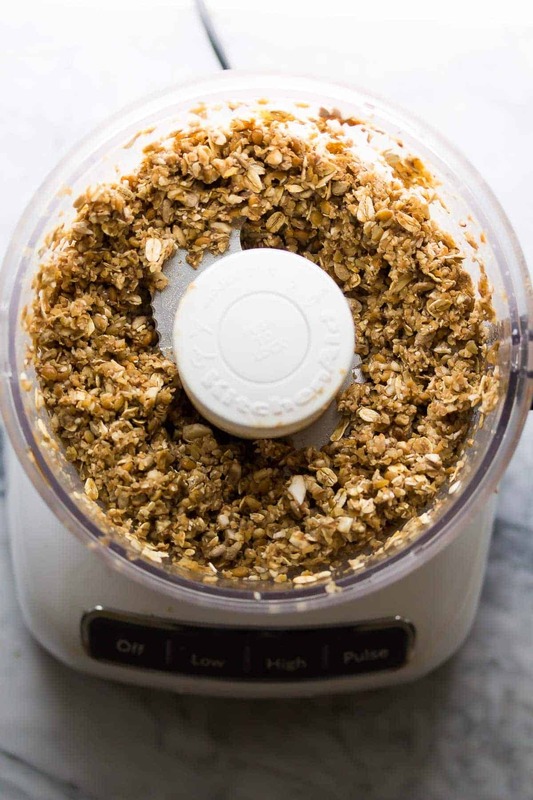 Scrape down the sides of the processor, add the rolled oats and pulse 5 more times (or until it looks like the photo above). Scrape the contents of the food processor into a large bowl. Stir in the panko and eggs. Form ½ cup patties about 1 inch thick. Cook in a non-stick frying pan for 4 minutes, then flip. Cook for 2 more minutes, then place a slice of mozzarella on top and cook for another 2 or so minutes, until cheese is melted and burger is cooked through. BruschettaStir together all bruschetta ingredients and set aside. This recipe makes LARGE burgers (4-5 inches across). You can get 4 burgers by making smaller patties. What a nice post its really awesome blog and this post barger sandwich is really niceeee……. I haven’t even tried this veggie burger yet and it’s already my new favorite- just from the photos!! Texture is everything, so I am glad this one has got it going on! I’m so glad you liked it, Shilpa! I need to make it again before fall hits us! Oh my gosh this looks so good! I am over here drooling over this dish right now. This looks sooo good! I love all of the extra toppings packed in between the buns. Can’t wait to give this tasty treat a try! Thanks for sharing the recipe! This is going to be our go-to veggie burger recipe from now on. Even the kids ate them! I’ve never made my own veggie burgers and have been wanting to forever. These are really making me want to get to it! I love the mushrooms and lentils, and those bruschetta flavors sound delicious! This is the perfect thing to use up my garden tomatoes! Burgers are one of the best parts of summer! These look amazing. I made a veggie burger recipe a few years ago and the texture was exactly that, mashed potatoes. 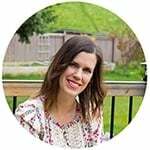 I just though maybe veggie burgers weren’t our thing – but maybe it was the recipe I tried! Have to try this one! 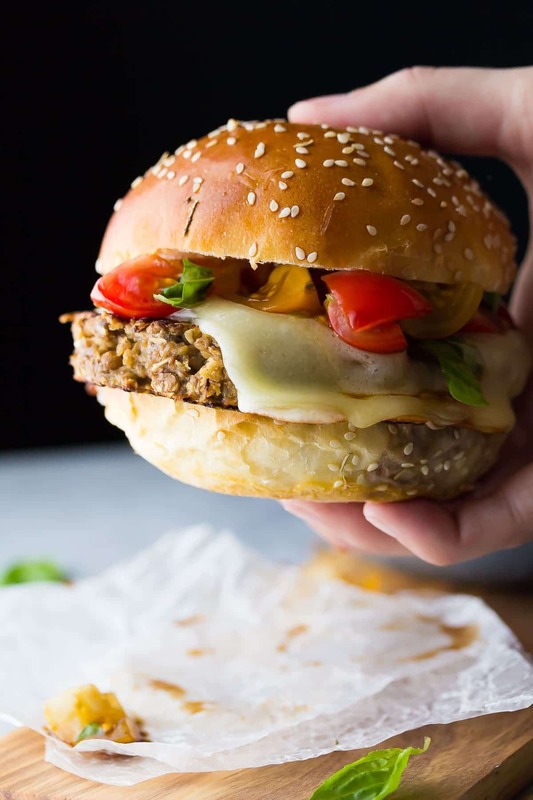 Veggie burgers can be so hard to nail, and it definitely looks lik you’ve done it here! Seriously swooning over all this summer goodness and I seriously love these photos too! I can’t wait to try these, Denise! 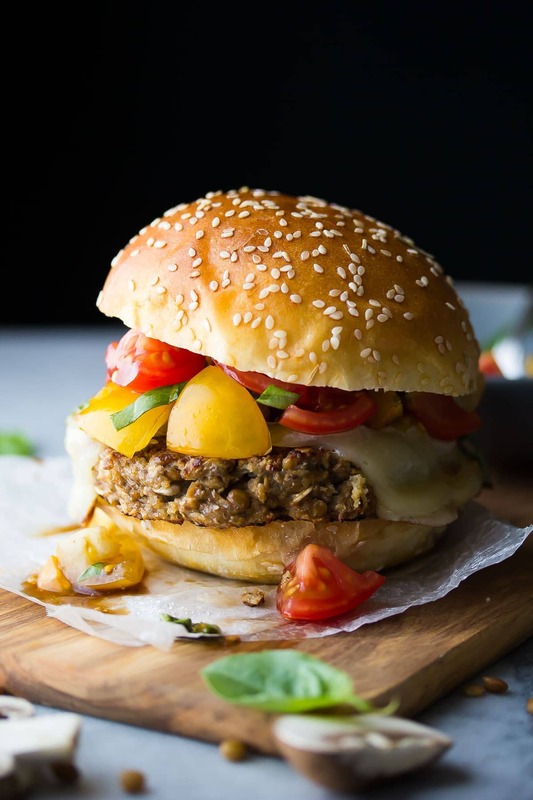 I try not to eat beef burgers too often, so I’m excited for this healthy veggie version! And, your photos of these burgers are gorgeous!!! This is just the burger I need to get my hubs on board with veggies burgers! It has everything I love and yay for not being wimpy too! Looks delicious and the bruschetta topping sounds amazing! I love veggie burgers and this one looks delicious, Denise. Love the bruschetta topping – a perfect summer addition! Oh MY! You know I LOVE these burgers Denise..(!!) No doubt veg burgers can be tricky, but you nailed it with these! I can’t wait to give them a go.. the balsamic is making my mouth water! 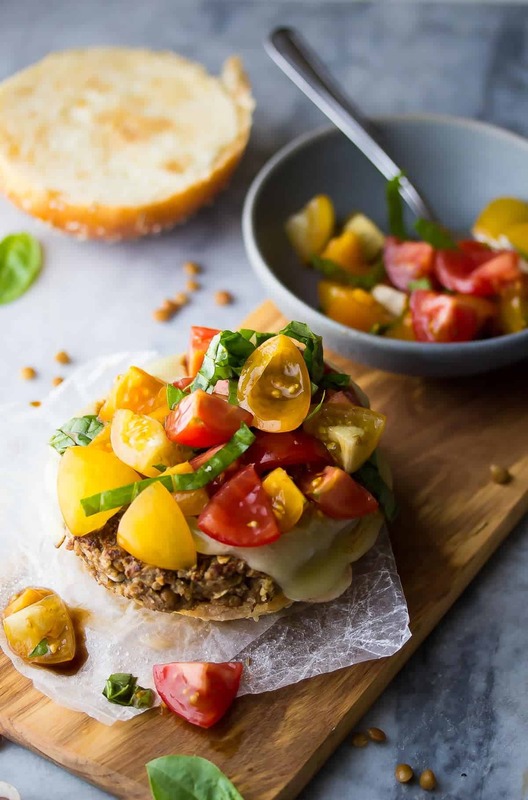 OMG, I haven’t even tried this veggie burger yet and it’s already my new favorite- just from the photos!! Texture is everything, so I am glad this one has got it going on! Plus I am loving the bruschetta up in here! Gimme gimme gimmmmeee! Cheers! Trade you one of these veggie hamburgers for one of my veggies hot dogs…!!!! DEAL! And now I’m heading over to check yours out! It’s definitely not summer without a burger! And I think this might just become my new favorite veggie burger, too! I love the mushrooms and bruschetta in here. Sounds so flavorful and perfect for an easy, summer meal!